AUGUST - Watch them bring home the gold! I know what you mean about mowing the lawn. I find it VERY physically taxing myself. Everyone must be super busy getting kids back to school and wrapping up other end of summer events. Me I mowed the lawn tonight so I could get some physical movement in. Wow half of our small back yard wiped me out. Way way way out of shape. Busy work week. Still thinking about changing jobs but still don't know what to do next. Been doing some art journaling which didn't answer my job question but did help me put a personal issue in perspective. A little cooler here this weekend which has been kind of nice. Wow, Doris, a sudden re-entry to the career world! I LOVED physics and chemistry - until I got to university. Then it got REALLy hard. Best of luck with what I'm sure must be an extremely hectic time. Nera, I've never had an issue with swelling in the heat, but I hear others do. Sitting, certainly. Always good to have that checked out if you can, just to be sure. I've been getting to the gym, eating right, running a little and having lots of fun this summer - in between working lots of shifts. Life is good. Work is hard (SO hard), but life is good! I am having trouble with my feet and ankles swelling all the time this summer. Not sure if it is because I sit all day or the humidity that is causing it. Does anyone else have this issue? It has been quite bad this year. go doris!!! good luck with those classes, i always hated physics. My life has gotten a little bit crazy this past week. I was asked if I would consider a full-time teaching job at a nearby high school (1.7 miles...3Km). Hmmm. There have been zero applicants for this position, physics and chemistry. So, I suddenly became a full time teacher in Florida. I was TOTALLY unprepared for the beginning of school, started two days before me.....so last week was a just tread water and survive. Great kids, phew. I am now ready for this week and next........I will get ahead of the game ASAP. No my son seems to have lost interest in it. And it has been hot and humid here. And I could come up with several other excuses but you all have heard the same song before. LOL!!! No more catching pokemon, Nera? Good morning. Spent yesterday doing a fair amount of walking. Too bad it was all on sidewalks and asphalt. Got a little bit of a sun burn but all in all a fun day with the hubby. So nice to see you, Trish. What's with the wing? Doris, that's very interesting - I had no idea that there were any co-ed sports. We had our first 40 degree (I think that's around 90F?) yesterday. It's been brutal this summer. We're having a terrible drought and the heat won't quit. Ugh. Thank goodness for the community centre. I've been working out and the scale is finally starting to lose. Busting out of this plateau! I'm off to visit friends at a cottage for a couple of days to relax. I'm bringing frozen juice and fresh veg to stay on track with nutrition, and I'll bring my running gear, though I don't know if there is anywhere to run; it's on an island. We will see. Maybe canoeing? It's just nice to have a couple of days off in a row! See you all next week. Have a great weekend - make it count! Olympics? Love them, out girls are rocking it for Canada!! I watch the highlights of the events on the news. Plus hearing all the weird stories that are coming out of Rio. After reading about the country I now know why some of the brazilian bull riders buy ranches in the US after they win big on the PBR circuit. Hi team. I do like watching some of the olympics. Unfortunately, we don't get the correct channel(s) without cable or satellite, neither of which we have. So, at the gym, on the treadmill I get to watch. I watched the end of the equestrian team competition this morning. Did you know that it is the ONLY sport when men and women can be on the same team and compete against each other? There is no gender related bias in equestrian events. The oldest Olympian is on the New Zealand equestrian team, he is 60. It was a nail biter if you like equestrian events. Anyway, the race was good. It poured rain for about 20 minutes before the start so I was pretty wet for the run. It was good. I was in no rush as it was 89 degrees and about 85% humidity. I finished in the middle of the pack and then had ice cream. The next one in the series in October. 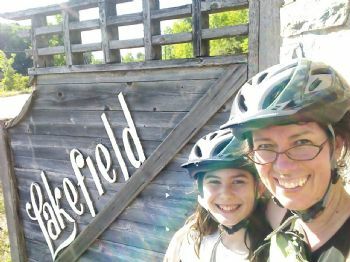 My little and I biked to Lakefield the other day - my first time on a bike in years! We apparently have a ton of nice bike trails in town - I shall have to check them out. I watch what I can of the Olympics - but my husband hates watching sports of any kind Don't know why. I usually watch gymnastics (because that's some of the most amazing achievements, even if I don't get the scoring) and swimming. Sometimes I get a little volleyball, basketball or track & field, but I have to fight with my hubby to watch anything, grrr! I will watch as much of the Olympics as I possibly can. Which is really funny because the rest of the year I don't want my Schwartz other than my Steelers or Penn State football. For some reason the Olympics has always got my attention. I love the way these young athletes devote themselves to achieve a goal for their country and themselves. I watched some of the parade of nations. Was confusing because the didn't do it all alpabeticaly. At first it seemed that way then in the middle of the H's Yemen was introduced. Then later in the P's they were introducing countries that had different starting letters. I do like to see all the countries and what their official uniforms look like. For me if I remember to watch then I will but it isn't must see tv for me. I agree the sports that have a clear winner are my favorite too. You ran faster than him so you win. Not well your leg extensions weren't as good and your arm movements weren't as clean so he wins by .009. I'm watching the Rio Olympics, USA and Croatia tied at 4. After 2 hours dancing and 20 minutes basketball Friday, I'm wondering if I should chill out or exercise this afternoon. My upper back and hips are sore this morning. I'm in my exercise attire. I'm cranky if I don't exercise. I may try jogging mixed with speed walking before full-blown running, I haven't run in a marathon! Quick post - I got to see a little of the opening ceremonies at the gym. They were nice - not so crazy flashy as the Beijing games! Oh my GOSH, I forgot what magic a good warmup can do! I swam 12 lengths of the pool (took me 15 minutes and tOTALLY wore me out) and then ran on the treadmill. I was on FIRE. I had no lag at the start, went straight to 4mph and kept it there till the gym closed - lol! I felt like I could have run all night. I know it's not "fast fast" but it's a lot faster than I have been going. I'm not good with the calculations, but I've averaged about 10min per km lately and tonight I ran 8min50sec per km for 25 min - so 3k. Anyway, it's the best I've felt on a run in forever. So, warmups are in! must run - not literally. Good night! I don't watch many of the games. If I do, it's the events that have clear winners. I don't like ones decided by judges. (Gymnastics, ice dancing). I like points, not opinions. I'm excited for the Olympics! I love watching all those athletes work hard for their goals and dreams. Good morning. A day off for me starts with tea and a power bar. Then a day spent going to thrift stores. No real agenda just a day for bumping around. Hello hit August! I'm not an Olympic watcher anymore either. Since I got rid of TV anyway. I do like the winter games, but I haven't really watched properly since Vancouver. Don't tend to watch it myself. So excited for the Olympics, I love watching these fantastic atheltes.